Cracks quickly appeared in a newly relaunched peace process on Sunday just hours after the start of US-mediated indirect Israeli-Palestinian talks, as Washington warned both sides not to jeopardise the process. Underscoring the deep mistrust between Israel and the Palestinians, the United States announced the start of the talks, after months of arduous shuttle diplomacy and false starts, with a caution to both sides they would be held accountable if they did anything to "seriously undermine trust." As if to highlight the fragile state, the US announcement describing confidence building measures already supposedly taken sparked the first spat. "Both parties are taking some steps to help create an atmosphere that is conducive to successful talks, including president (Mahmud) Abbas' statement that he will work against incitement of any sort and Prime Minister Benjamin Netanyahu's statement that there will be no construction at the Ramat Shlomo project for two years," State Department spokesman Philip Crowley said. 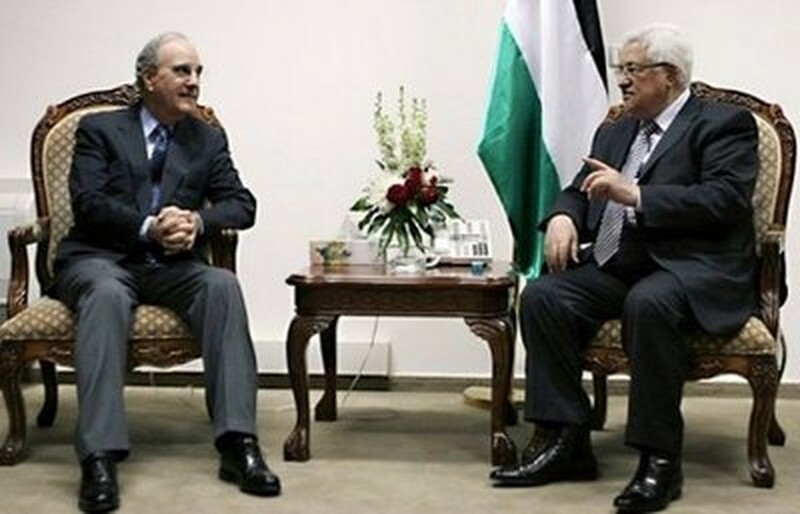 Palestinian president Mahmud Abbas (R) meets with US Middle East envoy George Mitchell in the West Bank city of Ramallah. An Israeli official immediately denied Netanyahu had given any such promise. "The prime minister has clarified, over the whole process, that building and planning in Jerusalem will continue as usual, exactly as it has under all governments of Israel in the last 43 years, and no Israeli commitments have been given on this issue," an official close to Netanyahu said in a statement. The Israeli official said that while no commitments have been given, Netanyahu had informed the US that under normal planning procedures it would take several years before any construction would start. "In reality, the planning for Ramat Shlomo will take at least another year and actual building will only start in a few years," the official said on condition of anonymity. Proximity talks were originally due to start in March but the Palestinians withdrew after Israel publicised plans to build the 1,600-home Ramat Shlomo project in annexed east Jerusalem. The Palestinians quickly accused Israel of trying to undermine the process. "The Israeli statement is an attempt to embarrass or challenge the US administration," Abbas aide Nimr Hammad told AFP. "The Israeli government must choose between peace and settlements," chief Palestinian negotiator Saeb Erakat told AFP. Netanyahu's statement on why no construction will take place at Ramat Shlomo over the next two years also indicated the hurdles he will face in making real concessions to the Palestinians because of his hard-line coalition. Right wing parties were quick to accuse Netanyahu of betraying his electorate. "The announcement from the US that Netanyahu promised to freeze the Ramat Shlomo building for two years proves that Netanyahu lied and continues to deceive his supporters by announcing that building will continue in Jerusalem," lawmaker Aryeh Eldad of the hawkish Jewish Home party said. "Netanyahu is betraying his voters and the ideology with which he was elected." Jerusalem and Jewish settlements are among the thorniest issues in efforts to achieve a peace deal. The Palestinians want east Jerusalem as the capital of their promised future state, but Israel considers all of the Holy City to be its "eternal and indivisible" capital. The Palestinians only agreed to consider fresh talks after receiving US assurances that the Jerusalem settlement expansion plan would be frozen. The indirect talks, which both sides are hoping will revive the peace process after a 17-month break, are expected to cover all final-status issues, including borders, security and Jerusalem. The way was opened for both sides to move ahead on Saturday when the Palestine Liberation Organisation (PLO) gave its backing to the start of indirect talks with Israel. The Palestinians reiterated there would be no direct contacts for now. "There are no negotiations between us and the Israeli government," Erakat said. "The discussions will be held with Mitchell and the Americans, and they will mediate between the two sides." Mitchell, who left for Washington shortly after the talks, will return to the region next week, but there is little expectation the process will produce tangible results other than a possible resumption of direct negotiations. "If we didn't have any hope, we wouldn't have got involved in the (indirect) talks. But we don't have any illusions," a senior Palestinian official told AFP on condition of anonymity, while stressing the difficulty of "obtaining anything from the Netanyahu government."